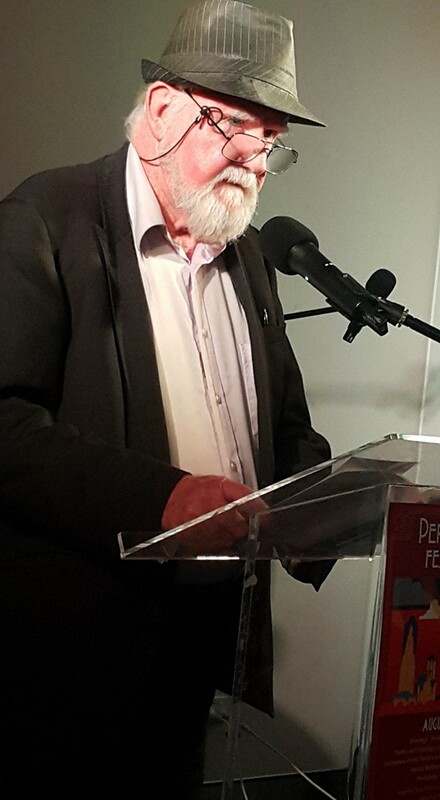 The 2015 Perth Poetry Festival was held at a number of venues around Perth between 13th and 16th August. Pick up The West to see their full page ad of “What’s On” for the month of August asselected by the WA Tourist Bureau and you are shown events like the Periwinkle Festival in the farthest reach of the North, but you don’t see anything remotely mentioning our annual cultural landmark WA Poets Inc. (WAPI) Poetry Festival. On the other hand the Perth Literary festival in February, run through UWA has feature after feature. Is it money or the Establishment speaking away from the oily rag that sustains the WAPI Festival? That said we have a great collection of Annual Patrons such as Lucy Dougan, Kim Scott, and this year’s inspiring Nick Hasluck, poet himself and considerable novelist winner of an Age Prize award as well as a retired High Court Judge. His speech was magisterial and is now circulating on many online magazines. He wondered aloud what drives the poet and yes, it is the desire to be heard or to influence others and he turned to Baudelaire wondering what the ‘new poetry’ would be over a century ago. Baudelaire used the metaphor of the albatross that bird that soared endlessly graceful in flight with great sweeps of movement, but once on the ship’s deck almost misshapen, vulnerable, clumsy,tormented. He told then the anecdote of a fellow writer who was on various writing courses and a wordsmith of quality, but always playing to minimal but highly appreciative audiences, until one magic day she was made the laureate of a presidential installation and spoke to a nation of over 250 million people. His message was that the poet must persist no matter what the outcome because of their love of words. Thus he provided a self aggrandising opportunity for this writer who featured two poems ‘Fireworks’ which talks of us who flare and fail, and ‘Poets Have Their Heroes’ that celebrates our great masters like Yevtushenko, Lorca, Dylan Thomas, and Gerald Manley Hopkins who soar above the rest of us. The festival was thus nobly and truly launched and the guests poets were invited to read. From the international Malaysian Angelina Bong, the interstaters Mark Reid, former West Australian and Premier’s Poetry Prize winner, and Pierre Van Osselaer the trilingual semiotic explosive expressionist from Victoria to two lively and emerging poets, ‘Chuckie’ and Alexis Lateef then finally Rose Van Son and myself. Malaysian poet Angelina Bong at the 2015 Perth Poetry Festival. Photograph Coral Carter. Now running for over ten years the Festival of Poetry is organised through a rolling committee, and interested members of WAPI can attend any of its meetings on an on and off basis with decisions made hopefully through consensus but put to the vote when necessary. However decisions made one week may be altered or modified at the next and happenstance as this may seem it leads to fine-tuning right to the week before the Festival Launch. Why is the Perth poetry scene so fragmented? What factors influenced you in choosing your particular poetic aesthetic? Is there a common ground beween performance and academic poetry? The themed sessions were remarkably innovative and an amazing one was the Forest of Poets which involved a host of poets reciting endlessly an individually selected and looped poem which could be activated by the public addressing the particular Poet Tree. Coral Carter’s official photographs, that can be viewed on the Facebook page for WA POETS INC., show the robot like stance of the performers more like those animated slot machines that purvey food, objects and even hot coffee in Japan. 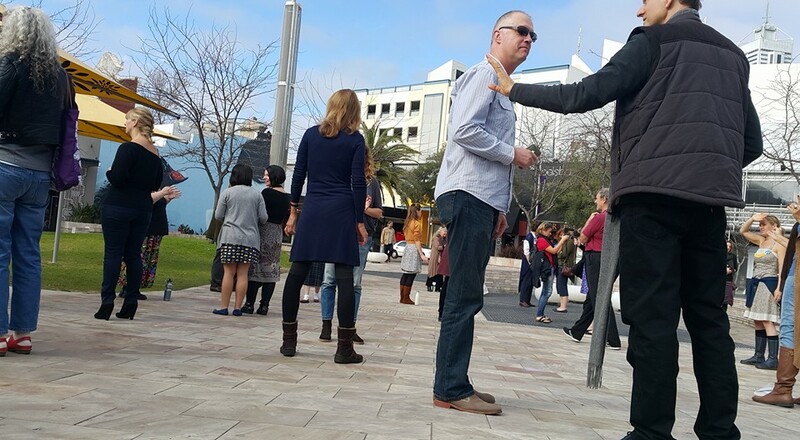 A Forest of Poets at the 2015 Perth Poetry Festival. Photograph by Coral Carter. Another one that was arranged by Zan Ross was called SENSE OF PALCE. Feeling that a session devoted to eco-poetry would not appeal to the non-scientific or conservation minded she called on a bevy of Perth’s most talented poets such as Amanda Joy, Annemarie Weldon, Jennifer Kornberger, and others equally gifted to generate a sense of place. Most people chose our own State and its remarkable physical and climatic features, but some ranged overseas and Indigo Eli chose her own personalised private room. Maitland Schnaars asserting his indigenous origins performed a dramatic monologue that involved red mud and blood that can be seen in the great aboriginal flag. Alan Boyd the Anti-poet re-read it with wodjola or white-feller inserts throughout. Boyd and Zan Ross brought it to a resounding climax with their combined responsive patterning. 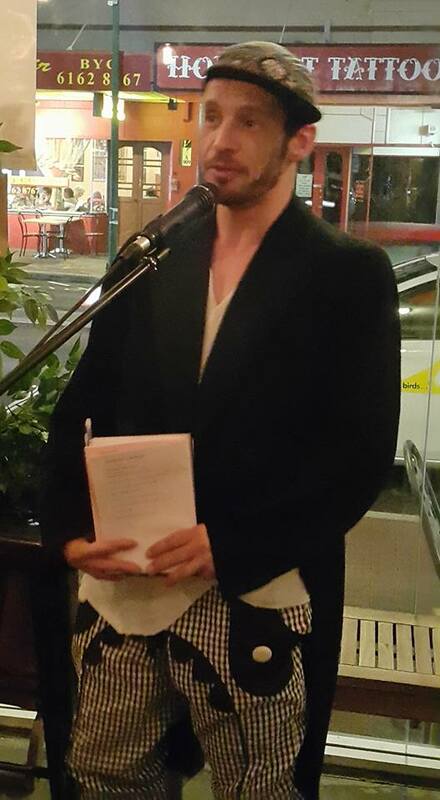 QUEER Poetry MC Scott Patrick –Mitchell. Photograph Coral Carter. ‘Outspoken’ presented QUEER POETRY at an alternative venue called Sparrow’s Nest and it was compered by that fashion plate experimental poet who won this years Creatrix Poetry Prize with his accessible ‘Makeup on the Midlane Line’. Watch out for his forthcoming Eastern States tour where he will give a twenty four hour performance. WAPI poets wrote and performed their poems to six selected artworks on permanent display and were featured in a very attractive chapbook which will be distributed to the public until next year’s festival. ASIAN CONNEXIONS highlighted poets from China, Burma, and Malaysia with European collaborations of a poem ‘Desert Dying’ with Australia famous Indian Jazz fusion guitarist Arthur Gracias. Later interludes were played by the Vietnamese artist Tam Thai who is regularly featured on Radio Saigon. 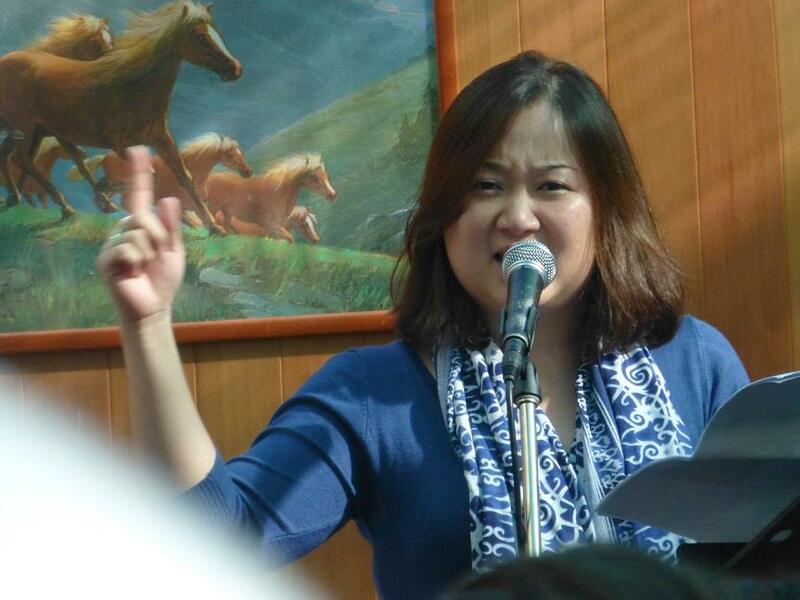 As our international poet Angelina Bong was a key performer her contribution was very insightful and full of goodwill. On the Saturday the Perth Poetry Club featured all the guest poets and a crowded open-mike session in a jam packed Moon Café and then at session’s end afficiandos hurtled over half a city to the Rosemount Hotel for our first Poetry Slam towards the National Slam Championship. 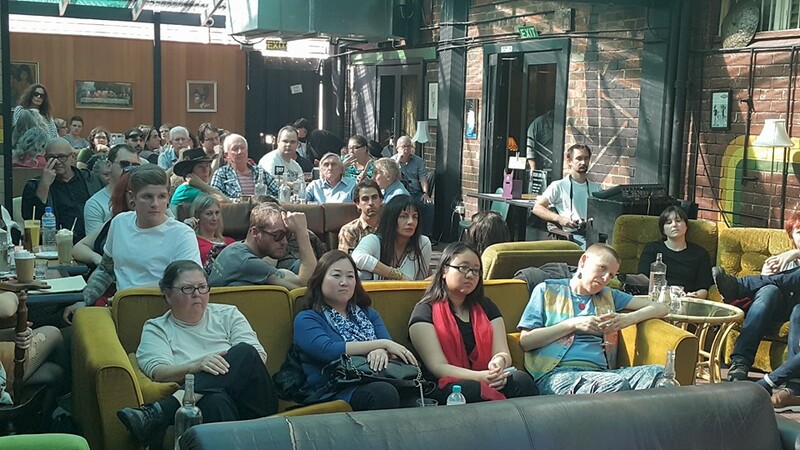 Part of the audience at the Perth Poetry Club. Photograph Coral Carter. A great boozy time on occasion and a word drenched time. I had hoped to make this more gonzo but at least you have the details of what was one of the best Festivals in Perth ever. Start getting ready to enjoy and perform at our 2016 Festival next year and find out that there’s another Australia outside the Eastern Coast, with just as fine poets. Peter Jeffery OAM exhausted survivor of this year’s WAPI POETRY FESTIVAL PERTH 2015 has been writing occasional poetry for over 60 years as finally revealed in his recent book True to Poetry in my Fashion published by Regime Press (https://rochfordstreetreview.com/2015/08/05/an-astonishing-61-years-of-poesis-allan-padgett-launches-true-to-poetry-in-my-fashion-by-peter-jeffery/). He has never forgets Rochford Street Review’s first notice of our first issue of Regime New Writing, Peter was a lecturer, a pioneer of Community Television, arts labs, multicultural arts centre, and currently broadcaster of The World of Art for 6EBA the West’s multicultural community station. This entry was posted in Issue 15, Peter Jeffery, The Perth Poetry Festival and tagged Alexis Lateef, Angelina Bong, Australian poetry, Australian Poetry Inc, Dylan Thomas, Gerald Manley Hopkins, Kim Scott, Lucy Dougan, Mark Reid, Nick Hasluck, Pierre Van Osselaer, poetry, Rose Van Son by Mark Roberts. Bookmark the permalink. It was a pleasure to be part of such a great Festival and to read alongside such talented poets.